As I have noted elsewhere, my plant identifications are often only to the genus level due to limitations on my knowledge, resources, time, etc. For any of you who look at a map and see where I live, you’ll see that things like herbaria and skilled plant taxonomists are far from home. 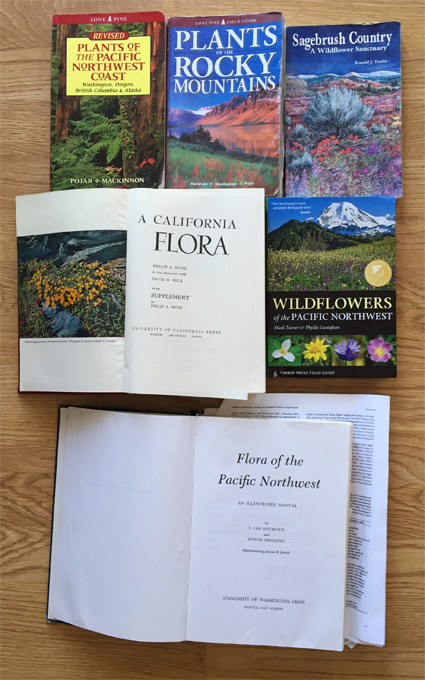 Botany books to meet my 2016 goal of better plant taxonomy. Graduate school gave me a great basis in plant identification and recognition of major families and genera. Since grad school I have learned a lot more. But, species-level taxonomy is still weak, and now that we live adjacent to California, total plant diversity is in a totally different class than what I am used to. Doing a decent job of aphid natural history and taxonomy will require substantially better botany skill and knowledge than I have gotten by with up until now. Anyone reading this want to come and teach me? Stop by and we’ll go out botanizing! This entry was posted in Uncategorized on January 1, 2016 by aphidman.